One of the golf industry’s latest equipment trends is ultra light drivers. Many advertisements claim that this new concept can increase both swing speed and distance. Assuming that advertising is mainly directed toward increasing sales, such claims as “lighter means faster and longer” are not always true. Allow me to explain. Everyone functions at a certain rhythm, e.g. you walk at a certain speed, talk at a certain speed, etc. This is determined in large part by your central nervous system and is personal to each golfer. To move efficiently and effectively, especially in the golf swing, it is important to swing in sync with your personal natural rhythm. Bottom line: it is true that you may be able to swing a lighter driver faster. But if your arms and club are outracing your body and you can’t hit the ball in the center of the club face, what good does it do? The second thing ultra light clubs do is allow the manufacturer to increase the club’s length in excess of 45 inches (the current average for public consumption) without increasing overall weight. The marketing claim is that you can hit a longer driver further. Again, the greatest distance comes from striking the ball in the center of the club face, and the chances of center-face hits actually decrease as club length is increased. In addition, clubs that are too long will disrupt the natural rhythm and tempo of any golfer. Why? Because if a club is too long, the club head does not get to complete its part in the backswing even though the hips, shoulders and hands have finished their parts. Now when the body says “Time to start forward,” the club head is still seeking its pause before transition. This makes it nearly impossible to square the club face at impact and hit the ball in the center of the face. 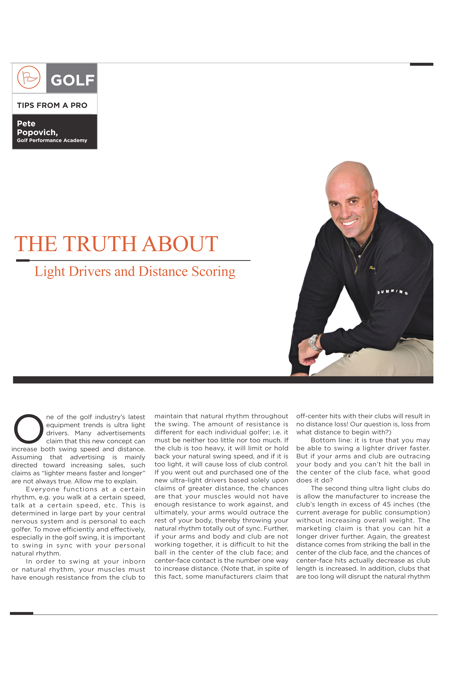 There is more to hitting a golf ball than speed and more to a driver than weight and length. To discover which driver best suits you in these and other respects, you need a teacher with the ability to match the club to your swing—not force your swing to match the club. If you would like to know if your driver fits your swing, hit the ball to maximum distance without sacrificing accuracy and shoot lower scores, call the Golf Performance Academy-Hilton Head. We can be reached at (843) 338-6737, golfacademyhiltonhead.com, or on Facebook at Golf Performance Academy-Hilton Head.